Share your photos on Instagram with the hashtags #secretagenttrenchcoat and #oliverands. 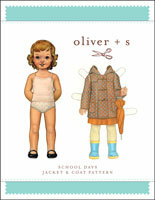 Boy's or girl's coat. 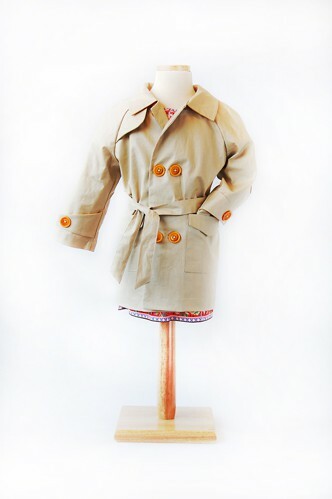 Classic unlined trench coat includes double-breasted button front, raglan sleeves, shoulder flap, button tabs at the sleeves, and a tie belt at the waist. The unisex version (View A) has pockets, while the ultra feminine alternate version (View B) features a dropped-waist skirt. Chest 26 3/4" 27 3/4" 28 3/4" 29 3/4" 30 3/4" 31 3/4"
Length* 15 1/2" 16 1/2" 17 1/2" 18 1/2" 19 1/2" 21"
Sleeve** 14 3/4" 15 1/2" 16 1/4" 17" 18" 19 1/4"
Chest 32 3/4" 33 1/2" 35" 36" 37 1/2" 38 1/2"
Length* 22 1/2" 24" 25 1/2" 27" 28 1/2" 30"
Sleeve** 20 1/2" 21 3/4" 23" 24 3/4" 26 1/2" 28 1/2"
This pattern is very easy to follow and produced the most adorable little trench coat for my granddaughter. I used a white with yellow polka dots bull denim and I love how it turned out. 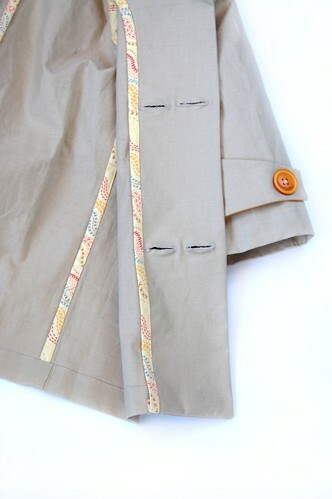 I added top stitching to all of my seams for a special touch. I also made her a little fanny pack to hold some of her gear. Easy to follow and customise - even for a novice! 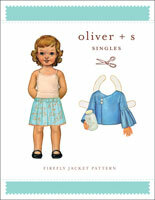 This project was my first attempt at sewing since high school...and the pattern and instructions were superb. Don't be put off by the confusing instructions common to store-bought pattern kits: this was a breeze to follow. 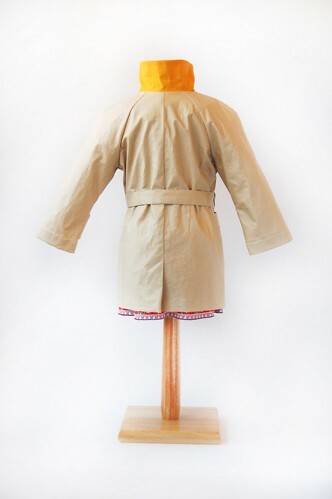 I used tan coated cotton to sew my 5-year-old a Tintin trench coat for his school book week parade. He got plenty of positive comments, and questions about where we found the coat! The only aspect I struggled with was the front facing: mine turned out a little bulky for my liking, but it isn't visible when worn, and doesn't affect the comfort of the wearer. I really enjoyed both the process and the product, which have given me the confidence to try making more garments. I would highly recommend going to a print shop to print the pattern at the large size: the A4 version is little fiddly to piece together. I recently made this coat for my almost 3 year old and love it. I wanted to match his dad's military issue trench and was able to easily alter the pattern to Beyer match the coat (i.e. lengthen to just pay the knees, move the pockets to size seam). I definitely recommend it and plan on making the toddler girls version for my niece this Christmas. What a terrific pattern! I recently made a slicker for my 10 yr old granddaughter with laminated cotton fabric. Sewing it up was great fun as it went together so perfectly. The slightly gathered skirt had me a bit concerned but the fabric gathered nicely & was easily sewn to the garment top (I pinned generously in the seam allowance). Buttonholes were a bit of an issue with the laminate, especially the top inner one. When making the pattern for a girl I would suggest to sew the flap onto the left side so the buttonhole foot has room to lie flat. Thankfully the collar hid my not so perfect buttonhole. I certainly will make use of this pattern in the future. This pattern was perfect: easy to read, easy to use, easy to put back in the envelope. Even if you haven't made a coat before, don't be scared because this one will get you there with ease. 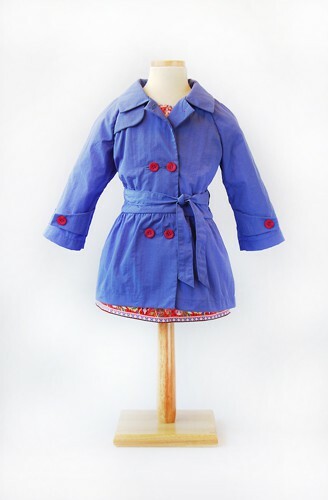 I had such a fun time sewing up this cute coat for my 7 year old. She wanted to be a spy for Halloween and I was glad to remember that Oliver+S had a pattern! I've sewed up quite a few O+S patterns over the years and this one is just what I'd expect - easy to follow, smart construction and beautiful results. I was very glad to have the size chart as when I measured my girl, it worked out to a 6. I made the smaller size (I would have normally just ploughed ahead and made a 7 or 8) and I was so glad I did, it fit perfectly. Now I really want to make another in a coated cotton for non-Halloween!! I dont usually sew apparel, but this pattern was very easy to follow. 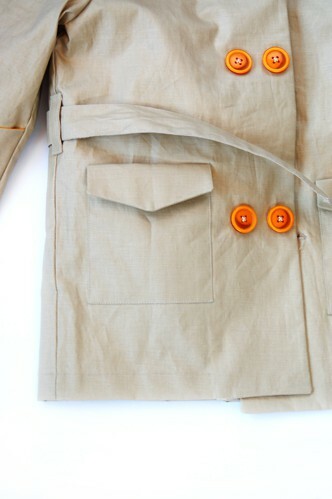 Made a great Inspector Gadget coat for my son! This pattern walks exactly what I was looking for and more. It was a great pattern, true to size, that all came together very quickly and easily. Thanks for an awesome pattern!! 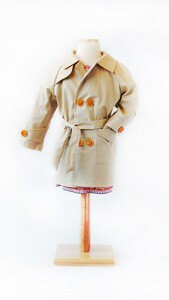 I sewed a Secret Agent Trench Coat as a Halloween costume for my 5 year old daughter. The coat looked beautiful when I was done - I was quite amazed that I was able to sew something that looked so professional. The pattern was so well written and easy to follow! I purchased the PDF version and had no trouble printing it and taping the pieces together. I'm not sure my 4-month old needs a trench coat, but now he has one! I made the smallest size for him for a Halloween costume - it sewed up quickly and easily, and it looks absolutely terrific. I could have gotten away with slightly less fabric for the 6-12 mo size, but appreciated having enough extra to make up for any potential mistakes. I'll be making this again for him when he's a little older as an actual jacket. 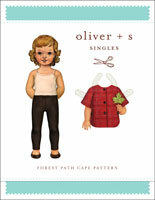 Discussion on the digital secret agent trench coat sewing pattern from the Oliver + S Discussion Forums. Find and share more photos on Instagram using the hashtags #secretagenttrenchcoat and #oliverands.